We arrived back home yesterday afternoon after two great weeks in the village. We’ll be posting more stories and photos in the coming days, so please be patient and check back soon. 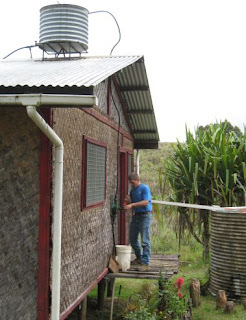 The house had a rain water tank, which was used for drinking and showers. Every morning we had to use this hand pump to pump the water to the holding tank on the roof. 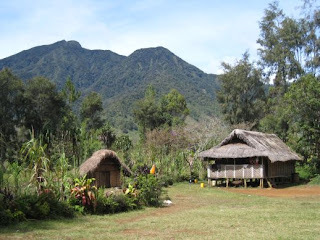 And here are some typical village houses, with Mt. Ialibu (Ya-lee-boo) in the background. 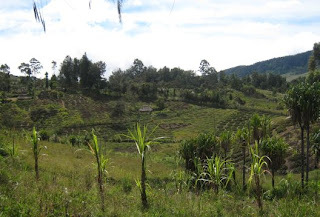 The Imbo-Ungu language area lies between Mt. Ialibu and Mt. Giluwe. The area is hilly with tall grass and occasional open areas that have been cleared for houses and gardens. and lots of snakes right? ugh! 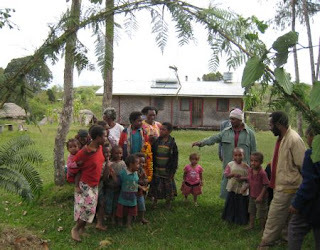 This was our village house! So cool to find it via Google!